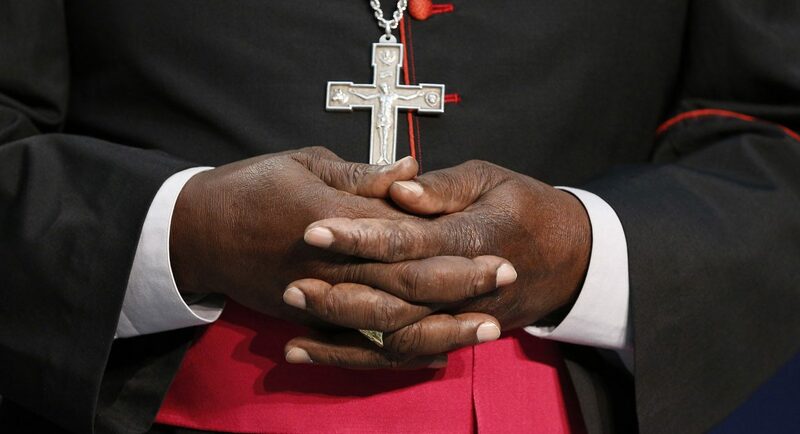 Archbishop Paulino Lukudu Loro of Juba, South Sudan, folds his hands as he attends a news conference at the Vatican Oct. 27. Pope Francis invited Archbishop Lukudu Loro, Episcopal Archbishop Daniel Deng Bul Yak of South Sudan and Sudan and the Rev. Peter Gai Lual Marrow, moderator of the Presbyterian Church of South Sudan, to the Vatican where they discussed the upheaval in South Sudan. (CNS photo/Paul Haring) . VATICAN CITY (CNS) — In a newly independent nation where more than 70 percent of the population is Christian, leaders of the Christian churches are indignant about the violence raging around them. Yet the South Sudan Christian leaders said they are certain that by working together, they can convince their people that dialogue, reconciliation and cooperation are the only paths to the peace and prosperity the South Sudanese have struggled so long to obtain. In a sign that he agrees, Pope Francis invited Catholic Archbishop Paulino Lukudu Loro of Juba, Episcopal Archbishop Daniel Deng Bul Yak of South Sudan and Sudan and the Rev. Peter Gai Lual Marrow, moderator of the Presbyterian Church of South Sudan, to the Vatican Oct. 27. The leaders in return invited Pope Francis to visit the country, perhaps with another Christian leader — such as Anglican Archbishop Justin Welby of Canterbury — to bring the message of peace and brotherly love directly to the people and the squabbling members of the government and political parties. The U.N. High Commissioner for Human Rights issued a strong warning Oct. 26 that the political rhetoric more often was turning into ethnically-based hate language and could set off mass atrocities. At the Vatican Oct. 27, Pope Francis and the church leaders discussed “the context of the tensions that divide the population to the detriment of coexistence in the country” and ways the good relations existing among Christian communities can resolve the tensions, the Vatican said in a statement. “In the light of the Year of Mercy in progress in the Catholic Church, it was underlined that the fundamental experience of forgiveness and acceptance of the other is the privileged path to building peace and to human and social development,” the statement said. After meeting the pope, Archbishop Lukudu Loro told reporters he and the other leaders were visiting global Christian leaders to inform them about the situation in their country. “We are being defeated. Our message to our people and our government is not being heard,” he said, but if Pope Francis and other leaders start speaking out and urging the international community to get involved, perhaps a mediated resolution can be achieved. “The pope can help South Sudan,” he said, because “we are a God fearing nation” and people respect his leadership. Archbishop Deng, the Episcopal leader, said it is difficult for a new country to convince people with different ideologies to come together and make the compromises necessary to forge one nation.